We work with a number of industry media organisations, with whom we create and distribute original and high-value content for the HR, Analytics, Technology and Business Strategy communities. Our media partners attend our events and help amplify the messages being communicated by the speakers, the outcomes from the panel discussions, and the personal experiences of people attending. Partners include large organisations, niche publications, professional associations, individual bloggers and global influencers. If you would like to discuss working with us, we would be glad to speak with you. Please get in touch here. We are differentiated by our capability to execute the advice we provide to help clients in the markets where they operate today and where they want to be in the future. Delivering this kind of value requires the skills to integrate a broad range of talent - across Human Capital, Strategy & Operations, and Technology - aligned to the unique needs of our clients’ industry sectors, businesses, and organizations. Actionable insights, hotspots and trends. We give you the power to make evidence-based decisions and tackle critical people challenges. Building on decades of experience analysing pay and HR data, our powerful technology helps you cut through the complexity and unlock your people data. We validate and integrate data from all of your workforce systems. Supplemented with our market benchmarks, you can have confidence in the decisions you make. We have a proven track record in providing information solutions for HR professionals in the UK, USA and the Netherlands. Kogan Page is the leading independent global publisher of specialist business books and content with over 900 titles in print. Founded in 1967, our award-winning work offers solutions for professional practice and academic achievement in both print and digital form. Our author experts come from the most prestigious academic institutions, international commercial organizations and professional associations - they deliver high-level, accessible, professional content to our readers in our key subject areas: Finance, Risk, Information Management, Marketing, Branding, Human Resources, Coaching, Logistics, Supply Chain, Entrepreneurship and Careers. With over 50.000 visitors per month Analytics in HR is the leading online community for HR Analytics professionals. On our blog, we publish quality articles about best practices, success stories, and tutorials written by experts from around the world. Through the online HR Analytics Academy, we prepare HR professionals for the future of HR and help them advance their careers. HR Grapevine is the number one online community for senior HR professionals as it has the largest and most engaged audience in the industry. Our news, magazine and events cover a variety of subjects, including HR Operations, Leadership, Compensation & Benefits, Learning & Development and Resourcing, in a way that is both provocative and exciting. We publish and curate selective content about HR Tech, HR, Future of Work, Recruitment, Job Search, Talent Management, Leadership, Startups, and beyond. 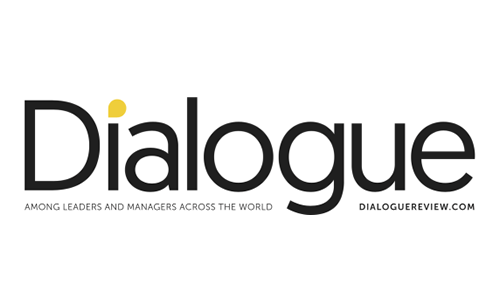 The Dialogue platform is created specifically for leaders, managers and policymakers, to help them navigate our complex world. Global in its design, every feature brings perspective from a diversity of markets and cultures. Its worldwide network of Knowledge Partners and Affiliation Partners enables Dialogue to share global thought leadership with its audience of more than one million readers around the world.